Clarins is a luxurious cosmetics company that has origins in France. Their product line include fragrances, makeup, and skincare products. The company was established by a medical student by the name of Jacques Courtin-Clarins in 1954. It is still a family-run operation to this day. Mr. Courtin-Clarins’ son Christian took over the role of chairman of the company in 2000, a position he still holds to this day. As mentioned, the company originally held operations just in France. They started establishing a presence in international markets starting in the 1970s. It wasn’t until 1981 that they founded a subsidiary company to serve the United States market however. Today, they have over a dozen subsidiaries that enable operations in approximately 150 countries around the world. The company manages other brands in addition to Clarins. These other brands include Azzaro, Thierry Mugler, and My Blend. There is also a ClarinsMen brand that offers skincare products designed specifically for men. 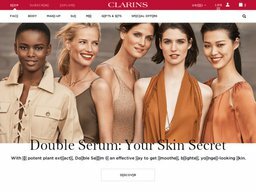 The official website of Clarins is located at clarinsusa.com. Of course, you can find their products available online. However, the brand is also sold in major department stores around the country such as Macy’s and Dillard’s. You can use the store locator to see exactly what locations near you have their products. The company really tries to make a visitor’s shopping experience special with special offers. With any order, the customer will receive three free samples. There is also a rewards program that gives customers 1 point for every $1 that they spend. Whenever they reach 200 total points, they are provided with a $20 promotional code to use for future orders. The company also offers free shipping on orders totaling over $75 in value. This offer is only available to customers residing in the 48 contiguous states. You can connect with the brand on various social media networks including Facebook, Instagram, and Pinterest. 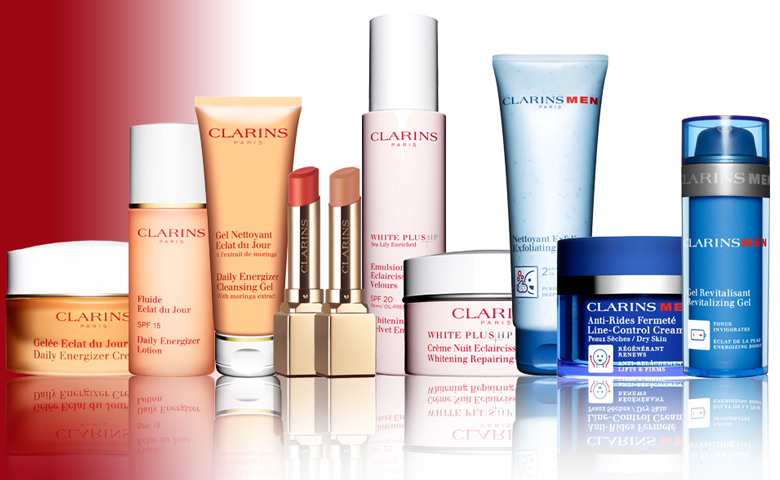 There is a range of beauty products for sale by Clarins. Their catalog is conveniently broken down into categories. There are various products for the face such as cleansers, toners, moisturizers, and serums. The products for the body are broken down into subcategories including exfoliation, hydration, and even pregnancy. Alternatively, you can shop based on a particular concern you have like cellulite control, firming, slimming, stretch marks, and water retention. Of course, makeup is one of the primary products offered by Clarins. They have makeup for the face, eyes, and lips. For the eyes, you can find mascara, eye shadow, pencil, eyebrow, and eye liner. There is also lipstick, lip gloss, and balm. Sun protection products and self-tanning products are also available. There are products for men in various categories as well for shaving, hydration, age control, and body care. Men also have the ability to shop by concern such as sensitive skin, puffiness, or hydration. The best way to save money when shopping at Clarins is to use the discount codes provided by Coupofy Coupons. The list of these special offers is updated constantly, so make sure that you check back often to see what savings you can take advantage of. To pay for your online order, you will need to use a major credit card. They accept Visa, Mastercard, American Express, and Discover. Paypal is also acceptable. If you want to return an item, then you have to make your request before 30 days has passed. If the product isn’t still in its original packaging or condition, they won’t accept it back. There is an email form on the website for customers to contact the company. They can also be reached by phone at (866) 325-2746 between 9:30am and 6:30pm on weekdays.